Finally after much frustration and trial and error I've managed to rebuild my render profiles for DAZ Studio 4.5. These scripts give you a quick way to change the output quality and dimensions of your renders by manipulating the Shading Rate, Pixel Samples, Pixel Filter Samples, Shadow Samples, etc. allowing you to quickly and easily go from a "Draft" render to a "Final Quality" render without having to mess with the Render Settings tab and remember what each knob does. These presets are free for any use, but may not be distributed by any method other than the original download link indicated above without my express written permission. 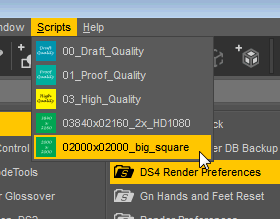 There are quality and render dimenion presets in this package. The quality items are defined as the table below. Render Dimension Presets are divided by aspect ratio and follow generally accepted video standards or are a multiplier thereof, e.g. 3840x2160_2x_HD1080 which is twice the resolution of HD1080. Draft Quality - Used frequently when setting up a scene. Proof Quality - Used for fine tuning lighting. Average Quality - This is the first "final" quality setting. It's for those who want speed or a little softness. High Quality - Getting serious, this is much finer and is for those who prefer sharper renders. Very High Quality - This is generally used for final renders for competitions and other areas where close inspection is expected. Insane Quality - This is very nearly the highest possible render settings that DAZ Studio can do. Don't know why you'd use it other than to torture yourself. FAB - U - LUS! If anyone needs a refresher, you can turn these into custom menu items pretty easily. Just right-click on the script and select "Create Custom Action" and from then on the script will be listed under the Scripts menu at the top of the screen. Yep, Thank you much for getting this ported over the DS4.5 I'll be all set up very soon. Thank you @adamr001! This script works awesome. I'm still trying to figure out the best rendering settings to use on my laptop without it crashing and burning and your settings for "high quality" does the trick. I get a wonderful render and no crash. Thanks, Adam. These have been really useful. 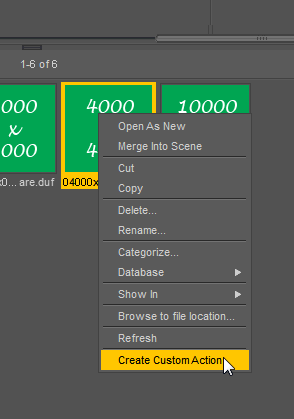 I added the render preferences scripts to custom actions and then created a toolbar for them. I love to switch easily between draft and high quality. I ran a test of all of them to compare render times on a single scene. I also compared the results to see if I can see much difference. Or course the results depend entirely on the scene contents, size, and other settings like Max Ray Trace Depth. These are the times I got. It may be interesting to someone else to see the time that can be saved with a draft render, for example. I rendered at 1024 by 768 with a ray trace depth of 2. I haven't explored the DOF or motion blur settings yet. The main thing the DOF/Motion Blur settings do is change pixel samples and/or Motion Blur Samples. They will have an effect, but not as much as the primary render settings will have. Adam, I've tried the DOF settings now, and all three seem to be the same. 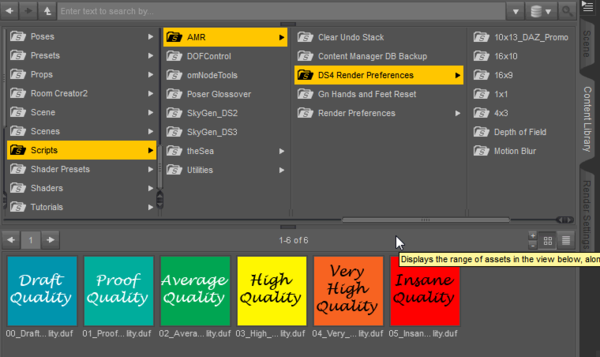 How do Std, High, and Insane DOF settings differ? Edit: I read your description above, but they all seem to set Pixel Samples to 32 (insane). I think all three Motion Blur are the same, too. Hello Will this work with daz 4.5 pro as well? Cons: Some of them crashed on my first tests, so I will have to look closely at which ones and why. Can these be used for DS4 also? I've been using these for a few days now -- they have really improved my workflow. Thanks. I am very happy to have found this thread! It's really going to help getting what I need from my renders! Thanks Adam! Thank you so much Adam! I just found this thread and I tried your script in the new BETA DS4.5.2.40 on my 32 bits test computer. Worked like a charm! Wow, its awesome, this works wonderfull!! Thanx Adam!!! I have now clearer ideas and very much better results! A recommendation is necessary (just for the less experienced...): mainly in the case of "Quality" renders, reboot the computer before rendering, for having the best RAM availability, and render to file, not to a new window, for avoiding using more RAM that the necessary. Will this work in 4.6? Thanks for these! I'm getting back into things and the last presets I had available were some older ones by Fisty for 4.0. Are you talking about those red and blue pixelated squares? That is a classic example of a bug with deep shadow mask lights and 3Delight render engine. Change the shadow type on your lights from shadow mask to ray tracing and they will not happen. You don't need insane settings. That will just eat up render time. Just switch your shadow type.